Knob and pull cabinet hardware are not included with your cabinetry and are purchased separately from cabinetry. There are endless amount of knob and pull hardware. A popular hardware company because of their pricing and selection is Amerock. Amerock’s website is organized so you can quickly narrow down your choices by type, style and finish. Amerock has a good selection of knob, pull, cup pull, appliance pull, pendant, latch and backplate hardware for your cabinetry. For Amerock’s home page -- CLICK HERE. With the Amerock website, you are relying on making a selection with the use of photos. Some folks would rather hold the hardware in their hand before making a purchase. Your local home center will have a decent amount of knob and pull hardware in stock for you to look at. Pricing for cabinet hardware can vary a lot. You can pay less than a dollar or more than $100 for hardware. It all depends on your taste. On average though, you should be able to find something you like in the $4 to $5 each range. Often customers will ask the Kitchen Gallery if they can install your new cabinets. If that is the case, then your estimate will have a separate line item for knob and pull installation. The average kitchen will cost around $150 for knob and pull installation. The average kitchen may contain 15 cabinets. When a customer selects pull hardware with stems, then there will likely be an additional installation charge. Hardware with stems often require four holes to be drilled. Two holes using a 5mm drill bit. Then those 5mm holes are enlarged and/or tapered using a tapered drill bit. For the average kitchen the additional cost for installing stem type hardware is $75 or so more. In the image below are two pulls. The one on the left is a cup pull with stems. The stem is circled in blue. The other pull is a flush mounted pull with out the stem. 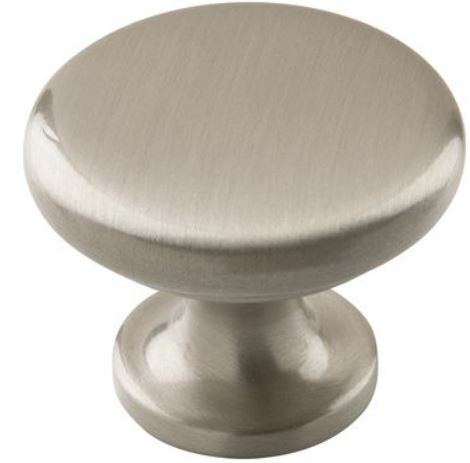 Generally speaking, a knob will get installed on a door and a pull get installed on a drawer. However, there is no right or wrong way to select your knobs and pulls. If you want all knobs, that is fine. If you want all pulls on your cabinetry, that is OK too. We think most folks like having a pull on any cabinetry that pulls out, like a drawer or a trash cabinet. Then a knob on any cabinet that swings open. It is always a good idea to purchase a few knobs and/or pulls than you need. For example, if you need 20 knobs, buy 22 knobs just in case there is a problem with one of the knobs during install. With regard to knob and pull positioning on the cabinetry, this is largely dependent on the door style you have. Positioning should be figured with the homeowner and the installer. In most cases a pull on a drawer is centered. Your kitchen may contain larger drawers that are more than 6 inches high. If this is the case you might want the cabinet hardware favoring the top of the drawer. If you have a wide drawer, say more than 27 inches wide, then you may like the look of two pulls on the drawer front. However, often it is easier to open the drawer if it is centered on the drawer horizontally. There will likely be some saw dust created that gets inside the cabinets while drilling for your knobs and pulls. Therefore, it would be good to leave your cabinets empty until your knobs and/or pulls are installed. A lot of customers like the pull design shown below to the left. One issue with this design is the ends are open and creates a bit of a hook. So when you walk by the pull hardware something on your clothing, like a belt buckle loop, might catch onto this so called hook side of the pull. This might annoy you a bit, if it happens. 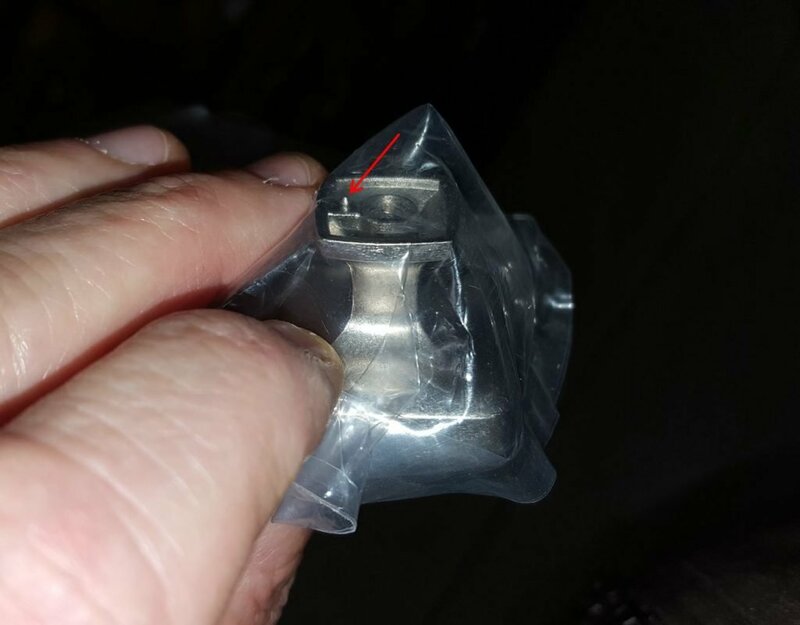 The image below to the right is a close ended pull, the hook is gone. So there is no danger of getting attached to your hardware, so to speak. So you might like the looks of an elongated knob as shown in the image below to the left, but you might not like to have to fix them and having to line them up again when they come loose. Overtime, knobs and/or pulls can come loose. Sometimes a elongated knob design might include a penetrating stem on the underside of the knob. In theory, this is suppose to keep the elongated knob from moving around. But in practice the penetrating stem can wear down a cabinet drawer. 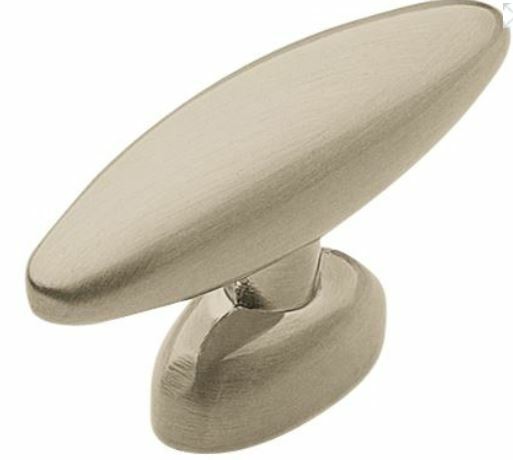 The image below shows a cabinet knob with a stem. 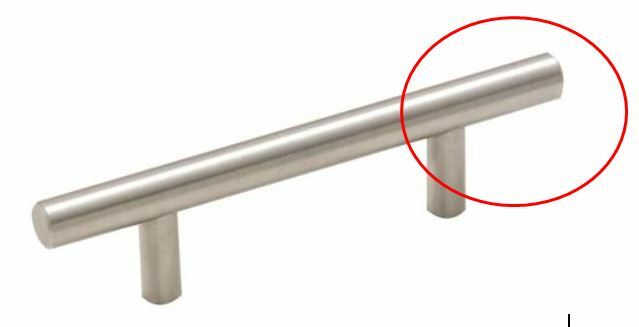 The sharp stem, indicated with the red arrow, is designed cut in the cabinet door or drawer and keep the knob from turning. However, my experience with this type of design ends up tearing up the wood on the cabinet drawer or door over time. So I would avoid a cabinet knob that has this sort of stem.